Select, adjust, and print colorful log graph paper online for free. With adjustment options to the left of the output window you can select from several colors, grids from 1 to 4 log cycles on each of the X and Y Axis. Also select here to change paper sizes to Letter, Legal, A3, A4, or A5 in Portrait or Landscape, and with a Square or Full Page grid. 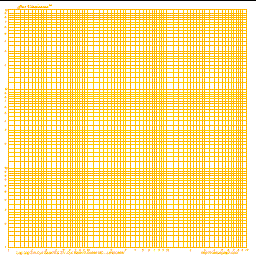 Need more custom settings; click here to open a custom graph paper screen to create Cartesian, Engineering, Log Log, Semi Log or 3 d Paper. Create and print colorful Log Log - Graph Paper online for free at http://customgraph.com. At Custom Graph™ its easy to create and print graph paper & overhead slides. Choose color combinations, and create Linear, Cartesian, Engineering, Logarithmic, and Semi-logarithmic graph sheets in metric, centimeter, millimeter, or inch grid sizes. PDF output is printable on paper or overhead slides in Letter, Legal, A3, A4, and A5 sizes in Portrait or Landscape. Using the following selections you can make adjustments to the graph paper in the output window. If you want to see it in a different color, select the new color from the list of colors and the graph paper grid will be adjusted to that color. If you want to change the grid size, select from the imperial or metric grid sizes listed below and the grid size will be adjusted to your new selection. Additionally you can choose to have from one to four cycles and can have the log cycles run vertically along the Y axis or horizontally along the X axis. If you need to make adjustments to the paper or layout, you can choose from five paper sizes, Letter, Legal, A3, A4, or A5 and orientate the printout to be Portrait or Landscape. If you need adjustments outside of the list available here, select the type of graph paper you need and the custom graph paper input window will open to allow you to enter your custom selections. You can choose any of the following colors or sizes and the graph paper in the output window will change to the selected color or size. These colors and sizes can be chosen in the adjustment control section just to the left of the graph paper image in the output window above. This additional control section has been provided as a reference section to give more detailed information than can be provided in the limited area around the graph paper image about the options that you have there. Once you are familiar with the controls provided here, you can easily use the same options located to the left and above the graph paper output window. Choose a new paper size for your graph paper if needed. The current size is Letter paper or slides. If you need a different type of Graphing Paper, choose any of the following to open a custom graph paper options window which can be used to create the custom graph paper you need. If you want to select from a set of pre-made graph paper of a different type, select from the list of graph paper types in the adjustment options just to the left of the graph paper output window.